Senate Passes Mikulski's Overhaul Amendment On Women's Health : Shots - Health News Maryland Democrat Barbara Mikulski's measure would expand coverage of women's health care, allowing the government to require insurers to cover preventive care and screenings for women at little or no cost to them. After three long days, the Senate voted on the first two amendments proposed to the Democrats' health overhaul bill, . Senators passed one from Maryland Democrat Barbara Mikulski and rejected the other introduced by Republican Lisa Murkowski of Alaska. Both amendments dealt with women's health coverage. The 61-39 in favor of the Mikulski amendment would expand coverage of women's health care, allowing the government to require insurers to cover preventive care and screenings for women at little or not cost to them. Not to be outdone, the GOP offered its own even broader version of a women's health amendment, but the Murkowski proposal was defeated 41 to 59. Murkowski's amendment would have barred the government from setting any binding health guidelines based on recommendations from the US Preventative Services Task Force. The task force's recent controversial announcements that women didn't need mammograms as early or as frequently as previously recommended, went against years of physician and public thought. In debate, the Republicans emphasized the need to keep the government out of women's medical decisions. Sen. Murkowski asserted that her proposal and the one from Mikulski had a lot in common, even calling them "dueling amendments." Sen. Mikulski, however, argued that the Murkowski amendment didn't do enough to guarantee coverage of the cost of preventive services for women. Mikulski said that under her amendment, women would never be forced to forgo a mammogram based on a task force recommendations. Instead, they would make a decision with their doctors and would have "universal access" to the service, she said. Just before the vote, Mikulsi urged her fellow Senators to pay close attention to the names on these amendments: "Vote for Mikulski, don't vote for Murkowski, and please on this one, get it straight." 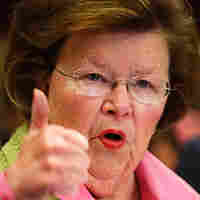 Her message got through, with the final score in the battle of the dueling amendments: Mikulski 1; Murkowski 0.